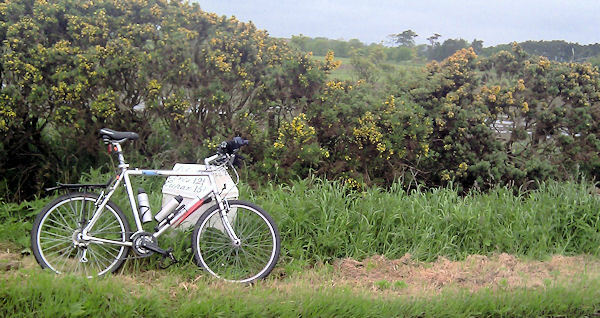 My Giant mountain bike, this morning, leaning against a milestone two miles outside Crail. A couple of weeks ago I was re-reading Leo Babauta’s excellent book Focus: A simplicity manifesto in the Age of Distraction in which he encourages people to slow down, reduce the number of things you are doing and focus on just one. That was something I needed to hear again. My mind had been spinning for weeks with the number of small projects that I was running at the same time; some web projects, some writing projects. I’d reached a point of stalemate, a mental impasse, where I couldn’t decide which one I should prioritise, which I should work on next. They all excited me. I wanted to do them all. And in the end I was doing none of them. So I took Leo’s advice to heart and began to simplify and reduce, and in my deliberations I realised the one thing that I really needed to focus on to the exclusion of everything else: get fit. My health had to be my number one priority. Before Reuben and Joshua were born in November 2008 I spent a lot of time on my bike, and with my dumb bell weights, and I lost a lot of weight. I dropped about 5-6″ off my waist. I wanted to get fit so that I could play with my children. I wanted to get fit so that I have every chance of improving my own quality of life so that I wouldn’t die young of heart disease or kidney failure or whatever. And then Reuben and Joshua arrived, and a few years later Isaac joined them, and I’ve pretty much not slept for the best part of three and a half years (averaging probably around 3-5 hours of broken sleep a night for most of that time). And my weight gradually crept up again as I ate at odd hours, or ate high calorie foods just to keep myself awake. Last summer I made the decision to get fit again. We were having issues with who needed the car (we went down to one car after the boys were born) and so I decided to cycle to work. My office in St Andrews is almost exactly 10 miles from our house in Anstruther. In September 2011 I was cutting the grass and taking a break I sat on a travelling rug with a ten-month old Isaac… and I couldn’t get back up. My back had gone. I went to bed and fell asleep only to be woken a couple of hours’ later with the most excruciating muscle spasms I’ve ever had. I was screaming in pain. It took me 30 minutes to crawl the 18 feet or so from my bedside to the toilet. The second time I tried it I could get only as far as the chair beside my bed. Jane phoned NHS 24 just after tea time, around 6pm. A doctor from the out-of-hours service arrived seven hours’ later, sometime around 1am. He returned four hours after that to give me a shot of morphine and I finally fell asleep, too doped up to care about the pain. It took another week or so to be given diazepam, which finally helped the muscles to relax, and another four months to see a physiotherapist. I was off work for about a month, and even when I returned I struggled to walk without pain. It took me until about early May to start feeling better enough to even consider exercising again. I was desperate to get out again. Nervously I got back on my bike in early May and rode a short and familiar circuit around a few of the local back roads. About a week later my back went again. More diazepam, more diclofenac, more 30/500 co-codamol and within a week I was actually feeling better than I had been the previous month. The pains in my legs had gone. I could walk again without feeling that my hips had been replaced with knives. Last Sunday I went out for a cycle. I made a conscious decision to go easily, to pace myself. Something that I’m not good at, but where has that got me in the past? I cycled for an hour and covered about 15 miles. It felt good. Two days later, on Tuesday, I went out again for a slightly shorter run. And I went out again this morning: 14.75 miles in 57 minutes. I was pleased with that. I’m determined to get fit. I need to lose weight to help bring my blood pressure down, for a start. I’m determined not to overdo it, as I usually do. I’m determined to pace myself. That’s been the big lesson from my back injury: pace myself. So for the next 4-6 weeks I’m going stretch every day (my physio gave me a bunch of back stretches to do twice a day), and start doing some daily stomach crunches to help strengthen my core, and go out cycling twice a week. I’ll see where I go from there. But this time I’m hopeful. By this time next year I should have cycled my way out of the fat lane.